I've always been a bit surprised that there aren't more ska and 2-Tone inspired theatre productions. 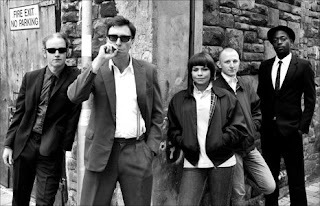 The U.K. of the late 70's and 80's was a cauldron of social and political change and the 2-Tone movement in particular seemed to be a product and a commentary on a country that was in turmoil over race, class and its own future. From great change often come great stories and art. 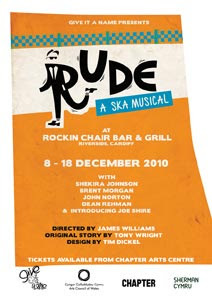 While there was long running musical in the West End of London called 'Our House' featuring the music of Madness (which won the 2003 award for best new musical), I'm happy to report that a prestigious theatre company based in Cardiff, Wales is presenting a 2-Tone inspired show called 'Rude: A Ska Musical' that it promises will offer an 'immersive' experience for the audience -- the show is staged with a live band in a Caribbean bar and restaurant. There is a great interview with the show's playwright Tony Wright in the BBC today where he explains how he channeled his own experiences growing up in Cardiff 30 years ago which form the basis for the production which revolves around the character of Roddy, a bi-racial race middle-aged man from Cardiff who relives his younger days as a Rude Boy on the Cardiff scene. The play is also a love story in the vein of Romeo and Juliet and Bonnie and Clyde – a skinhead with a racist father falls in love with mixed race girl from the Docks whose brother is king of the Rude Boys and doesn’t want his sister mixing with a white skinhead boy.